In front of an audience of Toronto’s classiest neckbeards, the dais was filled with a talent pool more uneven than an inconsequential WWF match. The superstars of the night were the much-loved Gilbert Gottfried , and Comedy Central Roast writers Jesse Joyce and Tony Hinchcliffe. The guys-in-plain-tights-using-their-real-names in this analogy were Spencer “Spenny” Rice, who admitted to only writing material on a napkin at the bar next door before the show; and Brutus “the Barber” Beefcake , who, while not a comic, was still under-prepared material-wise and could have used a writer. The only participant who fared worse was discarded 102.1 the Edge personality Todd Shapiro, who earned boos for boring the crowd. It was one of those performances that you keep telling yourself is intentionally weak (right?? ), but reaches a point where you no longer care because it’s just as much of a failure as a character piece. The silver lining came in the form of callbacks, as his very presence became a punchline for all who followed. Dead horses beaten throughout included Brutus’s para-sailing accident and facial reconstruction, and Gilbert Gottfried positioned as a child predator. The tone was edgy and evil, exactly what one expects from a roast. The only genuinely disturbing moment of the night: realizing that the only female comic on stage, Katharine Ferns, wasn’t there to perform but to anonymously deliver beer to the men all night. Really? The Sheik himself, now in his 70s, paid little attention to those who were speaking unless explicitly baited into an expletive-riddled rant (he’s still got it!). He briefly stood behind the podium at the end of the night for his closing remarks, but delivered little in the way of retaliation. Why should he? 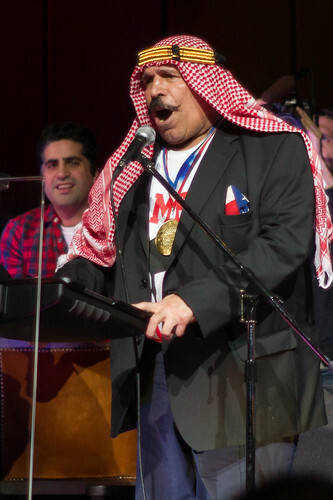 He’s the Iron Sheik, dammit.